Invevitably amongst us, icons rise up. Given any crowd, on any day, one individual will bubble up through the masses and become its reference point. Sports is not exempt. In fact, Sports is the leading producer of Icons on the Planet! Pound-for-pound, more HeeRoes are manufactured globally per season than one could shake a stick, bat or foot at. Here in the Center of the Universe, otherwise know as the MidWest, this phenomenom is no stranger. Hey, Chicago has 2 STAR pro baseball teams, 1 basketball, football, 2 hockey, 2 soccer, etc, etc, and a plethora of heavenly COLLEGE bodies – we’re bound by law to have at least a handful of superstars – even in those lean years no-body is collecting them trophies! Hence, this was a very small space. This did not stop the Manager from filling it with about 24 folks, all dressed in Orange (& blue) eating Orange Food (Buffalo Chicken Wings & BBQ) drinking Orange Beer (anything by Bud). A small wooden railing seperated us from the rest of the fan-filled-to-capacity bar, hundreds who were busy watching 4 huge screen sound-around TVs, fueling up for the SHow Down NCAA Playoff game between the Illini and the entire State of Wisconsin. The scantily clad waitresses (now, Hooters is half a Mile down the road and they’ve taught us Hooters IS Football!) wafted about in their shiny hose and mini-shorts, moving through the crowds like cigar smoke, finding their openings, taking the field. I followed their lead, and spirited my equipment and lights in to my covert position. And there I saw him! The One. The Ultimate. The Defining Moment/Man of the NCAA Playoffs: Mr. Blue Hands! Like hundreds of men before him, come rain, sleet or snow! he had taken up the mantle of Fandom and made the Sacrifice! When he was done being adorned, he strolled over to introduce himself to me/my camera. A president could not have walked with more dignity and stature. I rose up to my full height and accepted his partially orange hand and shook it with relish, as the Mighty Blue Puppet Hands rested on the table near. Somehow, staring into his eyes, I knew he was going to be more in my immediate future than perhaps I was prepared to endure. Although my reporter swore later she had avoided it at all cost, Mr. Blue Hands was in line for a Live Pop during our shot, along with a femFan wearing Lucky ORange Shoes (cute! ), and a Grandma wearing a blinking Illini billboard hat (cuter!). These folks stood waiting in the bowling alley of fate, ready to be picked off one-by-one by our producer’s call and we began! Suddenly, all spoken sound was GONE! It and our measly position was overun by 40 shouting bodies – some with trumpets and drum, tuba and tamborine, pompom and pomp! The Illini CHeerleaders and Marching Band had Arrived, unannounced and full of loud mobile PEP! 1. Cafe au Lait Cups: huge chartruese dishware on a shelf. 2. Ruffled Edges: on a stack of lamp shades. 3. Beautiful Walls: Prada Store on Oak & Rush. 4. More Ruffles: wonderful ombre skirt. 5. 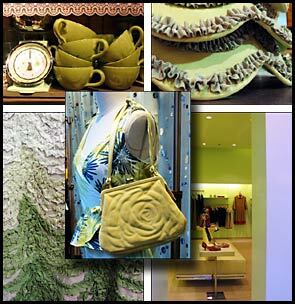 (center) Embossed Flower Purse: yellow-green mingles with blue & aqua.